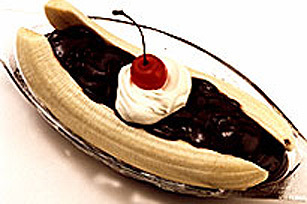 If you love banana splits, you'll love our take on the classic. Topped with your favourite flavour of JELL-O Pudding, this 5-minute no-bake dessert is sure to be a hit with the dessert crowd. PREPARE 1 package (4-serving size) JELL-O Instant Pudding, any flavour, as directed on package. SLICE 4 ripe bananas lengthwise and place on serving plate. Top with prepared pudding.